View was very nice .amazing woke up by cows ringing bells . Cows grazing everywhere you see . Location was good .300 mtr away from bus stop .every hour there is bus going to Grindelwald. If you miss the bus you have to walk no other option available. Got fresh milk everyday from near by dairy farm . Host was friendly . 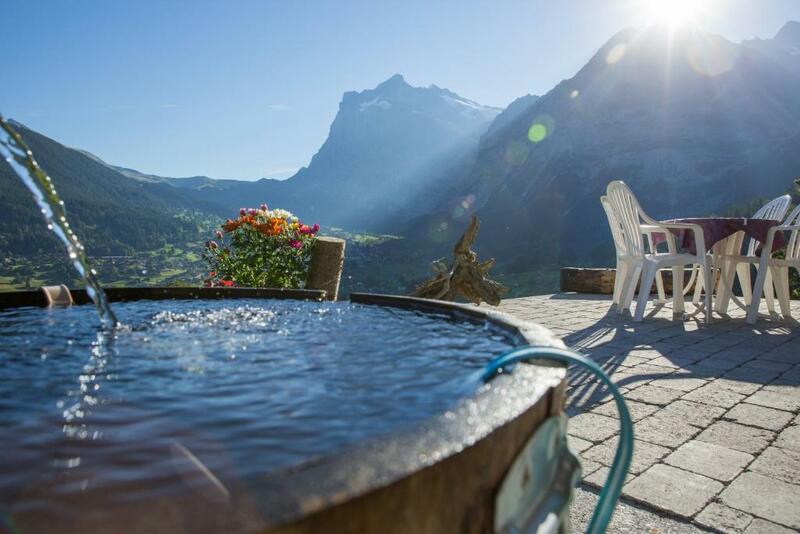 Great location, even with the necessity of snow chains or 4x4 in the winter, splendid panoramic views, overlooking the Grindelwald and the gorgeous mountains around, including the Eiger, right above, you can watch from the outdoor jacuzzi, next to a beautifull sauna. We loved the rustic atmosphere of the place and neighbouring farms. 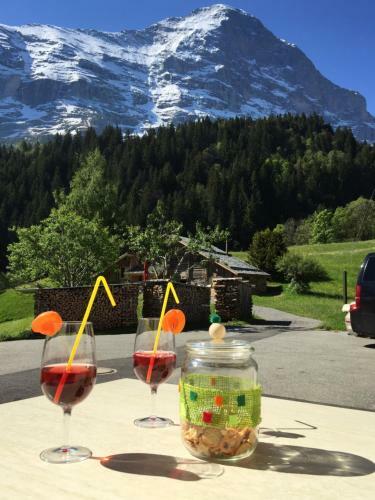 There´s a good bus connection to the village of Grindelwald as well as to First skiing area and the house is on the downhill slopes from Kliene Scheidegg and Mannlichen ski areas. Very kind and helpful owners. The house was built in 19th century, what includes is not soundproof, but we did not experience any noise during the evenings and nights. The smell of pine as your entered the premises was amazing. The views are spectacular. The property is not new but is clean and comfortable. Views over the valley changed almost hourly. The elevation is about 1200 metres above sea level and the north face of the Eiger fills the skyline on the uphill side. No need for bottled water as the water from the tap is amazing. Easy access to the cogwheel train to the Juangfrau which was amazing on the clear day we went. Beautiful view, isolated quite location, well equipped kitchen. The host was very kind, hospitable, helpful and was easily accessible over the phone for assistance. Unlike other accommodations, the host even arrived to meet us early morning during our departure. The Chalet was extremely clean on all fronts - right from the living room till the utensils in the kitchen. 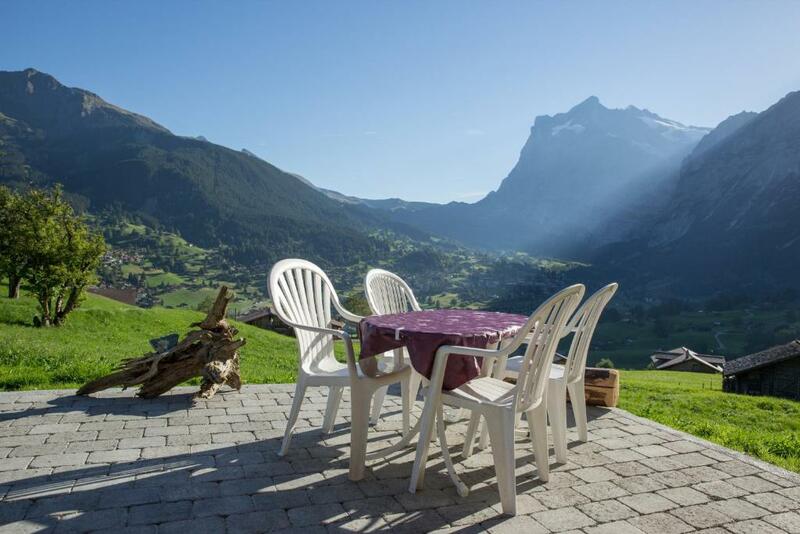 The Chalet is located up the hills of Grindelwald providing a spectacular view of the town. 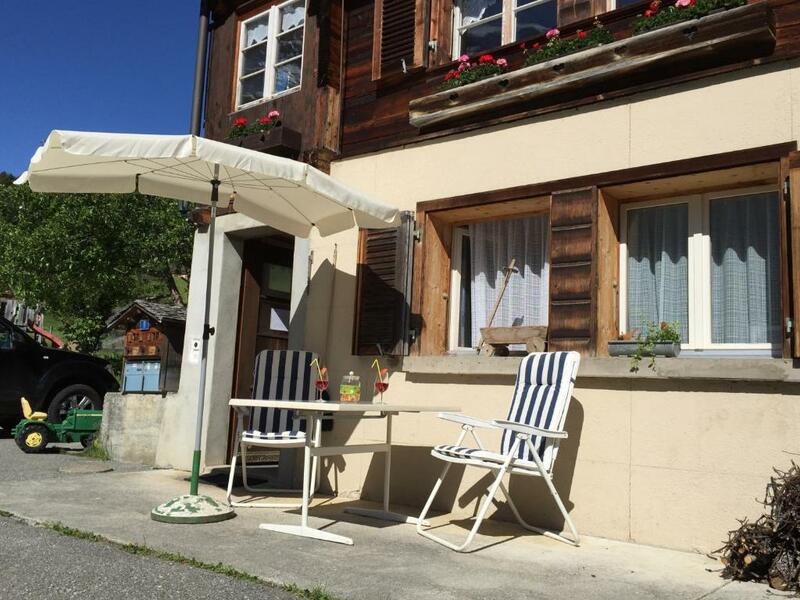 Lock in a great price for Eigerhome - Chalet am Bühl – rated 9.2 by recent guests! 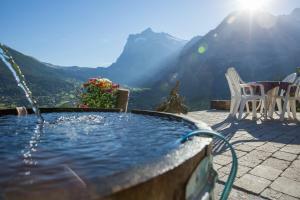 One of our best sellers in Grindelwald! Built in a classic Swiss chalet style in a quiet location, Chalet Am Bühl Eigerhome offers direct access to the ski slopes, free WiFi, and a small spa area with a sauna, outdoor hot tub, and relaxation area. Grindelwald, with 3 cable cars, is 2.5 mi away. The apartments feature a terrace, a fully equipped kitchen, a seating area with a flat-screen TV and a DVD player, and a private bathroom. Barbecue facilities and a children’s playground are located in the garden. The nearest restaurant can be found 1,650 feet from the Chalet Am Bühl Eigerhome. A bus stop is 650 feet away. Grindelwald Train Station is located 1.9 mi from the property. 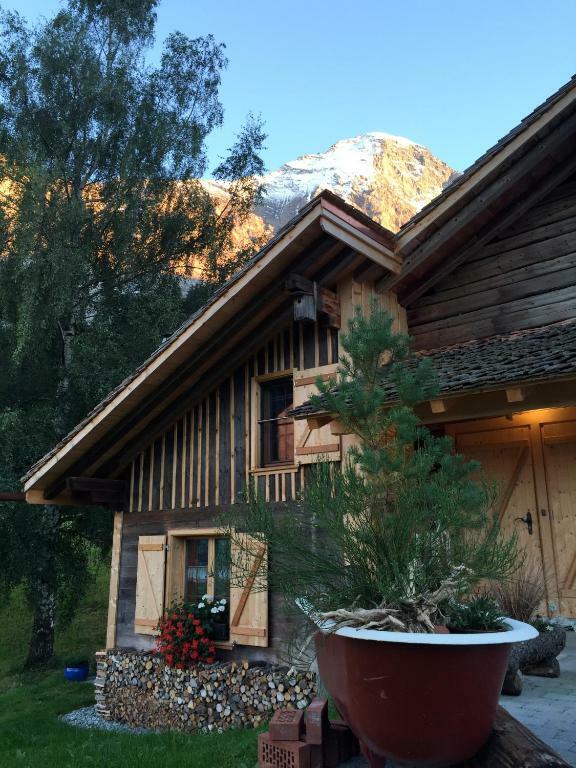 When would you like to stay at Eigerhome - Chalet am Bühl? This apartment with a terrace includes a fully equipped kitchen, 1 bedroom with double bed and a sofa bed in the living room, a seating area with a flat-screen TV and a DVD player. It comes with a private bathroom and a toilet. Please note the maximum occupancy is 4 people in all, whether adults or children. This apartment with a terrace includes a fully equipped kitchen, 4 bedrooms, a living area with a flat-screen TV and a DVD player. It comes with a private bathroom and a toilet. Please note that due to lower ceilings, the apartment is not recommended for guests taller than 6.4 feet. Please note the maximum occupancy is 7 people in all, whether adults or children. This cottage comes with a bathroom with a shower and a hairdryer, satellite TV and a well-equipped kitchenette. In addition, it features a living area, a fireplace for winter, underfloor heating and an outdoor seating area. Free WiFi is available as well. The 3 single beds are located on the open gallery, reachable via 2 steep stairs. Two extra beds are available on the gallery. Please note the maximum occupancy is 5 people in all, whether adults or children. Am Fusse der Eigernordwand liegt das Chalet am Bühl. Herrliche Aussicht auf Dorf und Berge. Ruhige Lage, Spielplatz, Gartensitzplatz, kleine Wellnesaoase. Ski-in / Ski-out. 250m bis Bushaltestelle. Das Chalet liegt mitten im Grünen auf 1100m ü.M. Im Frühjahr und im Herbst gibt es Kühe ums Haus. Grosser Umschwung ums Haus (2500m^2). Es gibt in der Nähe 1001 Ausflugsmöglichkeiten. Im Winter direkter Anschluss and die Jungfrau Top Ski Region. House Rules Eigerhome - Chalet am Bühl takes special requests – add in the next step! Please add that the property is in a remote location. Please note that the use of snow chains or a four-wheel drive vehicle is recommended in winter to get to the Chalet Am Bühl Eigerhome. If you´re traveling with children, please inform the property in advance and include their number and age. Contact details are stated in the booking confirmation. Sauna and whirlpool under stars. No washing machine was a major issue for us with a baby as part of our group. Access roads to get to the property are very narrow, but this is common in Europe. every thing was just perfect. The walk from the ‘Unter Eiger’ bus stop (Bus#123) to the Chalet was a tad bit challenging due to it being uphill (though it was only about 350m). Showering in the bathtub was uncomfortable due to the height of the ceiling (mainly restricted due to the sloping roof at the showering end of the bathroom). the location, the amazing view..